Time flies incredibly fast. It is hard to believe that in just two days we will hit the beginning of another year. I am pretty sure that all of you have certain expectations from the coming year as well as numerous goals to accomplish. This is the routine procedure that takes place every end of the year: we plan, sketch, pray and hope. However, before you set yourself to this set of simple steps, take a look at the adorable images that will advance your mood and anticipation. Below are ten breathtaking evening gowns that are worth to be rocked on a New Year Eve. 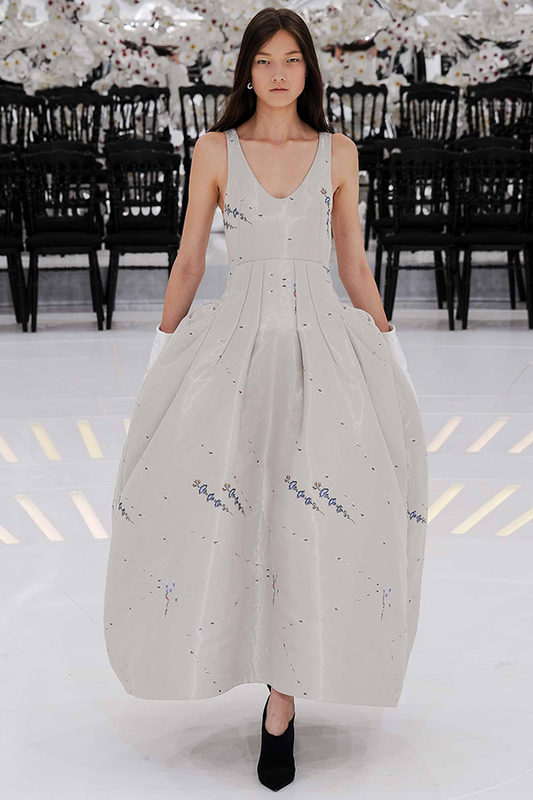 If you are in love with ball gowns and delicate shades, you can easily opt for this striking piece by Alexis Mabille. The moment I saw this astonishing number, I realized how badly I crave it. If I were to attend some fashionable event on the New Year Eve, I would definitely get something like this into my collection. Everything from the flawless design to the enchanting shade hypnotizes my eyes more and more. The glossy atlas along with the strapless geometrically shaped bustier create an irresistible composition. Armani Prive offers to add a dramatic zest to your look. 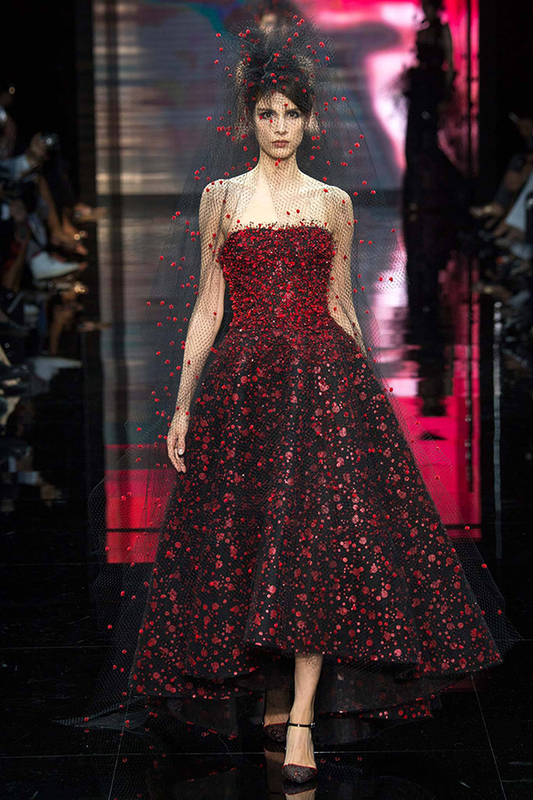 In case you feel like doing so, you will need a strikingly beautiful gown in black and a matching veil. The dress that features rich embellishment in red, strapless fit and asymmetrical cut goes along with the extensive piece of black mesh which is also designed in red. 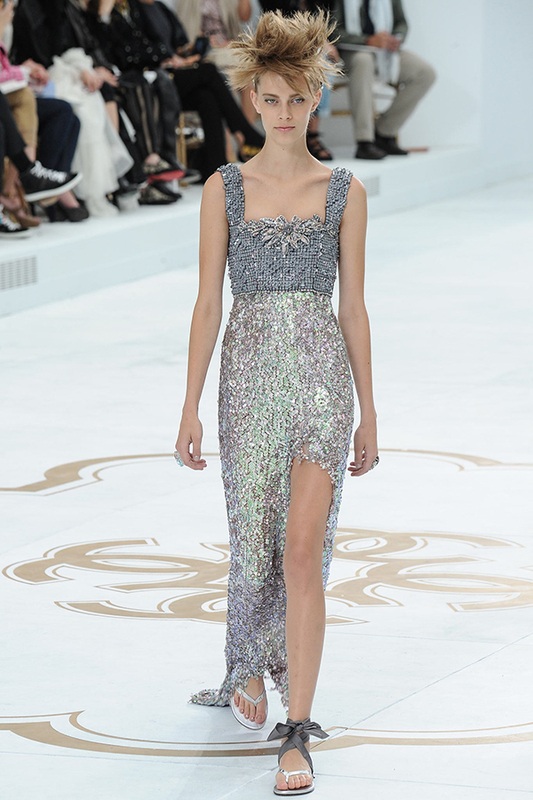 Chanel suggests to dress up in the most shining way possible. This straight fit floor-length gown with wide straps and an impressive slit is quite magnificent. The low neckline as well as the cute design on the bodice keep the front part of the frock always in the limelight. The numerous sequins, crystals and rhinestones that embellish the dress create a fascinating impression and make it very hard to not fall for the piece. Atelier Versace presents a marvelous gown which will speak to the boldest ladies in the universe. If you consider yourself to fall under this category, then feel free to try on this stunning number in black and plum. The sequined strapless bodice is complemented by a wrap-around full skirt in delicate atlas which resembles rather a tail. The enormous slit along the middle of the skirt reveals the model’s slim legs – which makes this frock even more alluring and cool. Christian Dior opted for an ecru shade which perfectly fits into the concept of a New Year celebration. This adorable dress in ivory looks very exquisite and luxurious. Due to the creative design, the frock also features a very unique touch. The baggy silhouette along with the tank bodice and low neckline are complemented with the light and cute embellishment in blue and mustard. Such a number will perfectly match with a pair of white gloves and a lovely headwear piece. 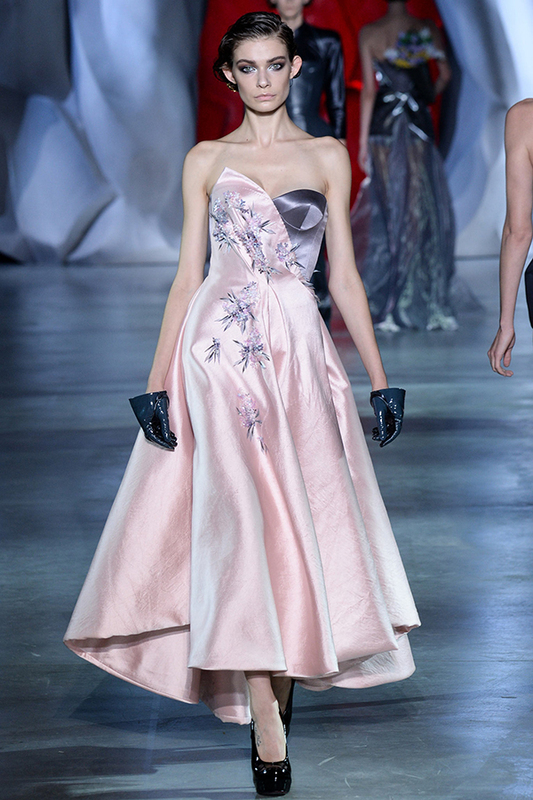 Giambattista Valli designed a stunning evening gown which was meant to inspire and allure. 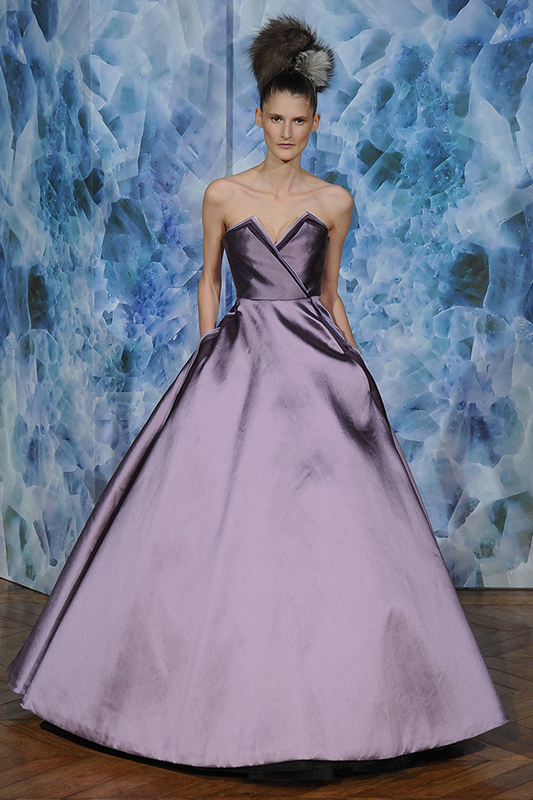 To start, the dress features one of the deepest and most delicious colors – purple (not to mention that it is one of my faves). Moreover, the very design and style of the number are quite appealing and tempting. The one-shoulder fit along with the wrap-around sleeve make this piece stand out. The light fabric as well as the engaging print complete the saucy look and make it more desirable. 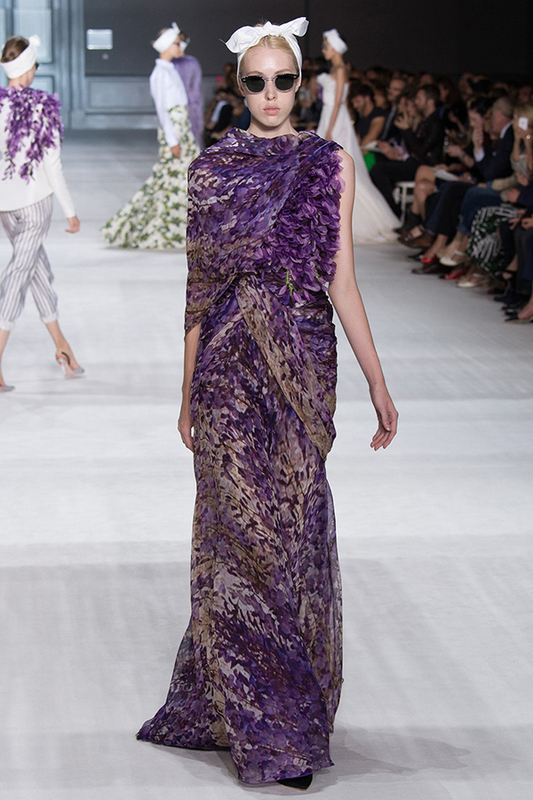 Elie Saab has to be on this list as well. There is no way we can have the set of most adorable gowns complete without a masterpiece from a Lebanese maestro. This impeccable creation will definitely speak to many of you. The off-shoulder fit along with the long sleeves and A-silhouette create a very strong impression. The delicate belt along the waistline stresses the alluring curves of the model, while the moderate tail adds up a striking zest. The color palette is also something that deserves our attention: light blue rhinestones are entwined with the beige and navy blue ones, while glistening against the exquisite and beautiful beige fabric. Ulyana Sergeenko went for a lovely and luxurious combination of powder pink and violet and topped the delicious ensemble with delicate silk. This strikingly gorgeous dress features a strapless bustier fit, full skirt and a mid-ankle cut. The bustier is designed in both colors, while the rest of the frock is embellished with cute ornaments in violet. 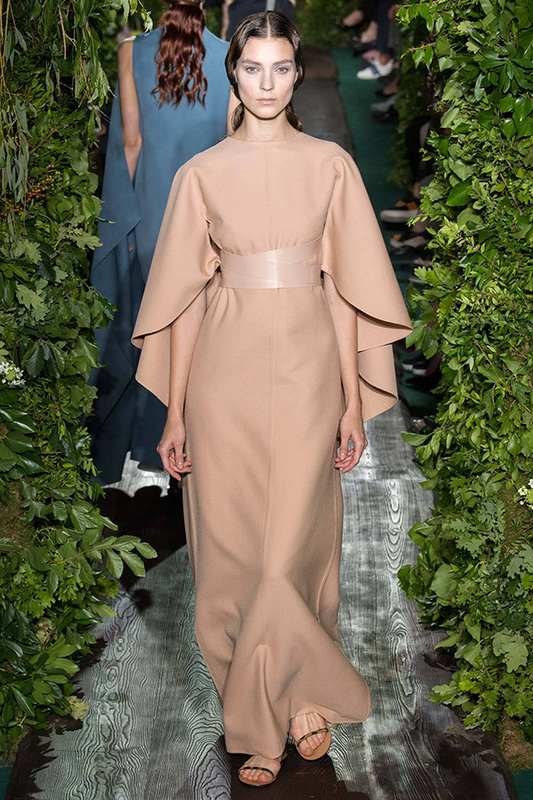 Valentino offers the most moderate and elegant gown of all the presented ones. So in case you are to attend a highly official and formal event on a New Year Eve, then this is what you need to go for. This sophisticated dress in camel brown looks astonishing and quite complete. You don’t need any extra accessories or embellishment in order to complement the look – which is itself quite an advantage. 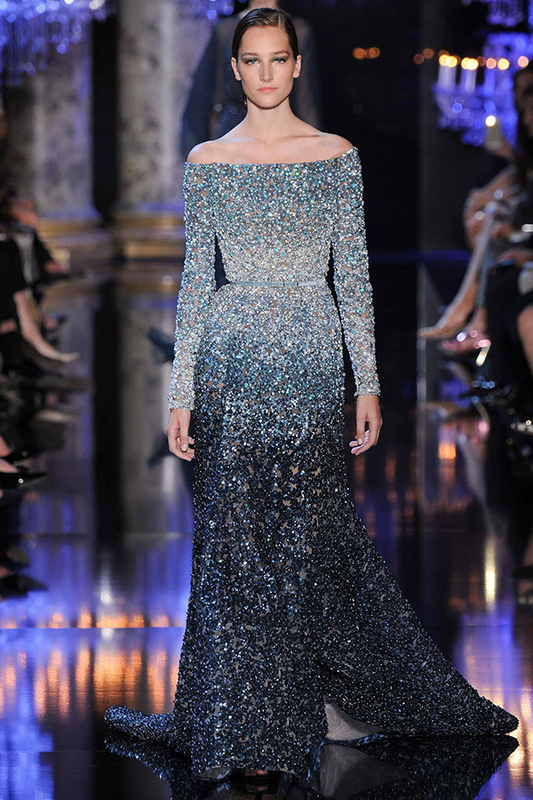 Last but not least comes an enchanting creation of another Lebanese designer – Zuhair Murad. This bustier gown in lust red looks so compelling and hot that it is impossible to not fall for it. The asymmetrical cut of the skirt would reveal your slender legs, while the alluring bodice will also keep you in the spotlight. The rich embroidery as well as slightly ruffled hem of the skirt completes this perfect dress and leaves no room for hesitation. These were the hottest and most gorgeous evening gowns to sport on a New Year Eve. I explore the world through the prism of fashion. Fashion is my everything: my universe, my air, my alter ego. I do my best to suit society, but when society does not bother to accept my way - I see no point in climbing up the mountain. It is the same with fashion: if they do not get what you wear, it is not your clothes that are to be trashed. Subscribe to our free newsletter to keep up to date with the latest fashion trends, photo shoots, and more.